Add extra security level to boost data protection for your e-business. Prevent your store from the common Internet threats like keyloggers, data sniffing and unsecured wi-fi connections. Stay convinced that your Magento account is available only to your staff members. Does this 2FA extension work with smartphones? Does it log all admin actions? As the Internet becomes more rapid and intuitive, users are getting less cautious. They often forget about the essential precautionary measures, when they login to their business accounts. As the saying goes: forewarned is forearmed. When you are prepared, you save yourself from many troubles and mess. The two-factor authentication extension is an easy way to get more confidence about security of your Magento admin panel. Two-step authentication is a simple yet efficient way to enhance your protection. This presupposes that to access your account, you have to prove yourself in two different ways. Besides from usual login and password, your mobile device becomes a necessary component of your authentication. As more services require to log in, users become less attentive. One-factor verification may become an easy target for the key loggers and data sniffing. The 2-factor authentication extension offers you a trustworthy solution of the present-day verification method, used by key figures of the industry (e.g. Facebook, Google, etc). Google Authenticator app is a simple way to make your personal device a crucial element for accessing the Magento account. The app generates security codes every 30 seconds, so even if your login and password were hacked somehow, there is one more additional security password. To free some IP addresses (e.g. your company) from a double checkup, simply add these IP addresses to the white list in the backend settings. The Magento 2 Two-factor Authentication extension offers a possibility to configure each admin role individually. Enable additional code for each particular company person. NOTE! The extension is compatible with iPhone (iOS 3.1+), iPad, iPod touch, Android (1.5+) and BlackBerry (OS 4.5-6.0) smartphone. Check if your device is able to run the Google Authenticator application before using the extension. This Google application generates additional security codes. To get more from admin management, check our extension Admin Actions Log for Magento 2. Track all the actions by store administrators in a real-time mode. Easily monitor the log history and all the login attempts. For more flexible work with user permissions, check out the Advanced Permission for Magento 2 extension. You can assign different role permissions for particular managers. 2-step verification is an extra layer of protection based on Google Authenticator or mobile device binding. The single-use 30-second code is apt to protect Magento 2 backend against cybercriminals. Powered by TOTP / HOTP algos, our 2FA plugin doubles your business data resistance against attacks. Why Do You Need 2FA? secure access to confidential business information. As a result, by avoiding security issues you increase user satisfaction and loyalty to your brand. To date, more than 90% of Gmail accounts don't use 2FA (Source). This is largely due to Google democratic approach, you can’t simply force users unconditionally accept the two-step authentication. However, in 2018 we see people suffer from banal email hacking and e-commerce fraud. What makes you think then that the problem won’t affect your business? Let’s take a guess, you may think you are only beginning to be an e-business, you may personally know all the employees, besides you have a small staff, who are easy to control. All these arguments don’t hold much water once your Admin account is hacked. What is a Magento 2 authentication factor? inherence (it’s based on a user's biometric characteristics): They are user's fingerprints, face, voice, iris recognition, typing dynamic and others. The factor is justly considered as one of the safest. 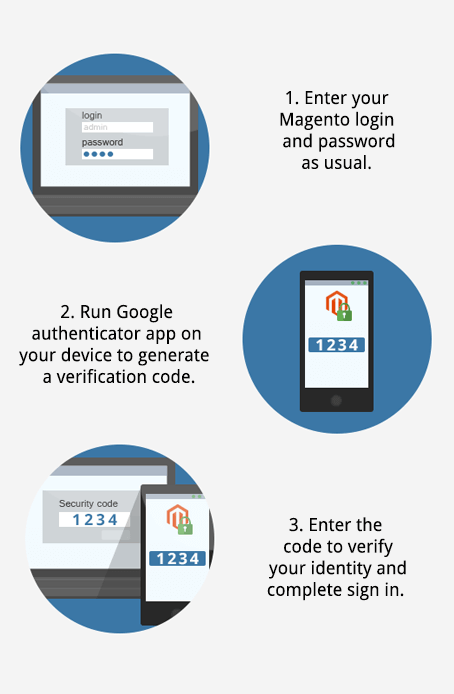 Our Magento 2 factor authentication uses 30-second Google Authenticator code sent to your mobile device. Double authentication is a popular security measure today. I can't say I ever faced a real attack. We implemented this extension only to ensure that our customers' data is safe. The installation was fast and easy so we didn't contact support, still based on experience with some other their extensions I can say that support is very strong here. We used m1 Security Suite when had magento 1 store. After we migrated, we decided to purchase some Amasty security extensions including this 2fa. Overall, a simple module that is very fast to configure but does it job perfectly.